The Toronto-based president and CEO Jason Moring tells THR of expanding into producing and financing and why he’s on the lookout for U.S. partners. When Jason Moring, president and CEO of Double Dutch International, takes stock of the global sales market for independent film, he doesn’t see crisis — he sees opportunity. That’s even after Canadian rival Entertainment One in January invested in Sierra Pictures and closed eOne International, its London-based international sales and distribution arm. Judging cast-driven theatrical releases as safe ground, DDI is pushing into production via a deal with Awesometown Entertainment (Get Squirrely) to co-produce two or three animated features budgeted in the $10 million to $15 million range each year. Moring also has made movies that he reps for worldwide sales rights a potentially safer bet for foreign buyers by lining up a $50 million P&A fund from private wealth management firm Fleet-Fairhaven to ensure a wide U.S. release. Plus, he has executive produced such movies as Terence Davies' A Quiet Passion, which stars Cynthia Nixon and Jennifer Ehle and will receive a gala screening in Berlin, and A.R.C.H.I.E., a family film voiced by Michael J. Fox. 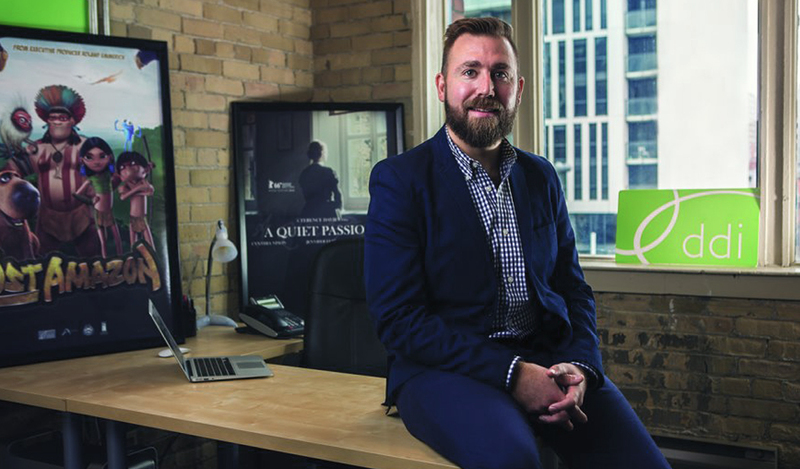 Moring, 36, sat down with THR in his Toronto office to discuss the state of the world film sales market, his push into production and his desire to cherry-pick some new executives. There aren’t many Canadian sales companies, and with Entertainment One closing its international sales division, the sector has shrunk. And yet you’re growing? The Sierra acquisition was to help [eOne] get involved with bigger content. For us, that only benefits DDI. We’re definitely trying to take advantage of eOne shuttering its international division to see whether there’s an opportunity to pick up some of their people as well. For us, they’re great. We have had a good run since fall 2014, where each market is seemingly better than the last one. We’re a younger company, we’re growing and emerging and we’re continually doing bigger projects. I know there are people out there saying parts of the market are in a downturn. But I really think you either have theatrical films or you have the other pool of films. If you’re not theatrical, you’re in a big, competitive pool, where there’s a lot of content out there, and that only drives prices down because buyers have options. For us, we made a decision two years ago to focus more on theatricals, so we weren’t cluttered up in that competition. Besides selling, you have expanded DDI’s portfolio to include the development and financing of new features. Why the push into production? The world looks to the U.S. to see what the U.S. will do with a film, and that will really dictate how [foreign buyers] feel about the marketability and commerciality of a film. If it gets a wide theatrical release in the U.S., the world will respond. If the U.S. just does a day-and-date release, the world will respond differently. So, to help keep that control internally, we’re trying to venture more into a production role and a co-producer role. We need to figure out ways to bring certain pieces to the puzzle early, whether that be financing or production talent, to give us an advantage. And with Canada being so lucrative when it comes to bringing production here, I see a role for us. Does that mean getting more involved at the script or packaging stages for indie titles that end up on your international sales slate? Independent producers trying to make a decent film budgeted in the $8 million to $15 million range sometimes make wrong decisions based on cast, and that eventually makes their film less attractive internationally. If we can get involved earlier, we can help guide producers in making casting decisions that will financially benefit their film. Big names are expensive, especially now with the collapsing Canadian dollar and the fact that top Hollywood talent is paid in U.S. dollars. The agents are certainly out for the benefit of their clients. There’s always seemingly a top-20 or a top-30. It’s a supply and demand function. Here, with the way the Canadian dollar is going, luckily our business is majority U.S. funds. That will benefit the industry as a whole. You’ll see over the next 12 to 24 months a huge influx of U.S. and international productions coming to Canada. They not only will get the same quality of work, they’ll get it at a significant discount when factoring in (the low Canadian dollar and) film incentives. It’s like doubling up. You have lined up a $50 million P&A fund to help ensure a wider U.S. release for films to give comfort to foreign buyers. What was the strategy there? We started talking in early 2015 to Fleet-Fairhaven, and we’re evolving to a revolving fund to support P&A. That ties into helping make sure the U.S. was fitting a certain release model that foreign buyers could depend on and be confident in. And the P&A fund allows us to ensure at least 800 screens and up to 2,000. The falling Canadian dollar also has you eyeing making more movies with U.S. partners, right? During the past six to eight months, there has been a handful of requests every week from producers asking if we can help them co-produce out of Canada. So we have a roster of producers we’ve worked with before that we are trying to bring into projects. And we’re looking at setting up our production shell here domestically so we can help with that. In today’s market, you have to be flexible. If you are just a sales company, that’s one thing. But we’re trying to be a little more, to bring financing, to help with production, to have the P&A financing. These are items that only a handful of sales companies are doing, and they are usually the bigger guys.